Debrah Shulman (vocals); Jeff Colella (piano); Larry Koonse (guitar); Abraham Laboriel/Chris Colangelo (bass); Bob Sheppard (reeds); Bob McChesney (trombone); Kendall Kay/ Joe LaBarbera (drums). Shakespeare has long provided inspiration for jazz musicians and filmmakers. The latter, in the film All Night Long, incorporated the saga of Othello in a modern setting incorporating Tubby Hayes, Dave Brubeck, Mingus and other jazz luminaries of the 1960s. In retrospect, Mingus would have been the perfect Othello. As it was, the music proved better than the film! Ellington's Such Sweet Thunder will probably go down as the definitive jazz/bard mix and deservedly so. It's a gem and deserves its high ranking in the Ellington canon. However, let's not forget that Shakespeare was a wordsmith and not a musician although he may have been capable of knocking up a tune on a virginal. And it's the lyrics of his songs which are featured here just as they have done in the past. Marian Mann, with settings by Arthur Young, recorded four of Shakey's songs with the Crosby Bobcats back in 1939 a couple of which are reprised here. In the early fifties, Cleo Laine recorded the same with the Dankworth Seven and, in 1964 Cleo, now Mrs Dankworth, recorded Shakespeare and All that Jazz - an album that is regarded by many as the ultimate take on what is, in my opinion, the combination of the world's greatest artforms - literature, theatre and jazz. 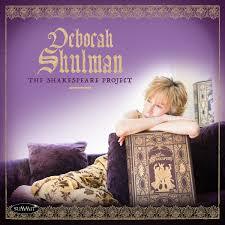 With such hard acts to follow, Deborah Shulman has taken a brave step and, in many ways, she succeeds. Just as Marian Mann set the ball rolling for Cleo to pick up and, via Duke's input, to run with, so Shulman has, at least, kept the ball in play. Personally, I wouldn't be without either and this one also has some great solos! Summit Records DCD 793 - Feb. 22. All the Worlds a Stage/If Music be the Food of Love; Blow Blow thou Winter Wind; Dunsinane Blues; Shall I Compare thee to a Summer's Day? ; Who is Sylvia? ; You Spotted Snakes; When to the Sessions of Sweet Silent thought; Sigh no more Ladies; Oh Mistress Mine; My Love is as a Fever; Our Revels now Are Ended.